Pistachio gelato from Bibelot: pâtisserie, high-tea salon, coffee bar, gelateria and temple to all things sweet. Melbourne prides itself on being the capital of cool, so when it comes to ice-cream – and gelato and sorbet and all things icy ­– it’s one of the country’s hot spots. Here are 5 places that go above and beyond just simple sweets. Dessert star chef Christy Tania opened Glacé in Windsor last year and her creations have ice-cream aficionados swooning. Try Ispahan, a lychee rosewater with intense raspberry sorbet, exotic sorbets including kalamansi ­(a Filipino citrus) and guava, and Japanese-inspired Matcha Adzuki; green tea-ice cream spiked with red bean paste. Tania’s repertoire extends beyond cones to flights of fantasy, with edgy spins on ice-cream cake. Case in point ­– Red Roulade, a flawless cylinder of silky coconut ice-cream with raspberry sorbet and Madagascar vanilla rolled in red sponge cake. Then there are fun specials like the Frozen Wagon Wheel Pop, a double disc of chocolate, choccy biscuits, vanilla ice-cream and raspberry fragments. Heaven on a stick. A French-trained pastry chef, Christy honed her skills at the legendary Hotel Ritz Paris and high-end venues such as Vue de Monde and Jacques Reymond, before opening dessert-only destination Glacé. “We play a lot with textures, not just ice-cream itself. The chocolate ganache stays chewy, we have crunchy meringue and chewy marshmallows inside the cake,” says Christy. Do try: Lamington – coconut ice-cream, chocolate brownie and a whoosh of raspberry sorbet. OTT, but what the heck! Flavour at Pidapipo Lygon Street span everything from summer fruits to salted chocolate. Italian gelato makers have set a high bar in Melbourne, but Lisa Valmorbida’s Pidapipò leaps that in a single bound. Lisa studied her trade at Italy’s Carpigiani Gelato University (yes, it’s a real thing!) and brings Italian flair and Aussie style to her gelateria. A queue regularly snakes from the diminutive shop down Lygon Street in Carlton’s Italian heartland. It’s worth the wait. Summer fruits – watermelon, rockmelon, cherries –­­­ are delicious ­but we’re all for loading our fresh waffle cone with banana caramel and biscotti or blackberry and salted chocolate. If you want to go authentically Sicilian, have your gelato piled into a brioche bun. Very Palermo. Or go old school, with a Coke Float, a flavour collaboration with Raph Rashid from Melbourne’s hip burger slinger, Beatbox Kitchen. It’s a riff on an old-fashioned milk bar favourite. Pidapipò also does ice-cream cakes, but nothing generic. Pumpkin Pie is a heady surprise ­– biscuit base, spiced pumpkin gelato, caramel sauce and pecan croccante. You can’t get this in Rome. There’s a Pidapipò in Windsor now too. Pidapipò’s gelato makers have set the bar high in Melbourne. Do try: Avocado and lime – quintessentially Australian. Sleekly minimal but still jewel-like with its studded emerald green sofas and mid-century chairs, South Melbourne’s Bibelot is pâtisserie, high-tea salon, coffee bar, gelateria and temple to all things sweet. 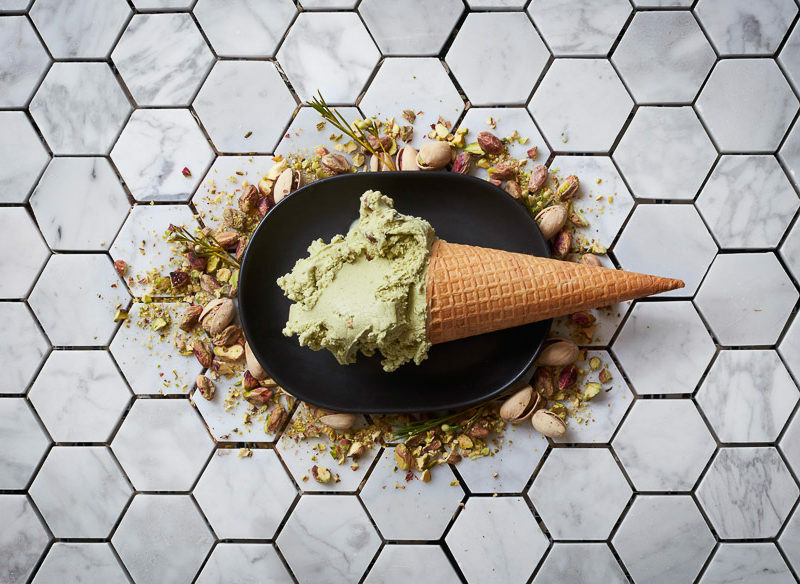 “We still like to nail the classics though, such as pistachio.” Classic it may be, but it’s a knockout, studded with caramelised pistachios. Do try: Dark chocolate sorbet­ – rich, dark and not for the faint-hearted. This unlikely outpost in Pascoe Vale South may not be on the usual hipster trail but don’t let that stop you because Miinot owner Emma Nicholas-Jennings makes gelato with love ­­– and imagination. The stellar selection changes daily, an impressive array of small batches and new churns. There’s the French connection ­­– Rosemary Loves Nougat seems straight from a sunny day in the south of France, and so does the honeycomb infused with lavender. Lemon Ginger Pie is subtle and refreshing though if you fancy something more quirky, you might opt for the ever-so-slightly Mad Hatter’s Tea Party combo of charcoal and vanilla bean. There are plenty of gluten free and vegan options, plus a sibling store, Poco Gelato, in Port Fairy. Do try: Rosemary Loves Nougat. Speaking of small batch, ChillBro in central Melbourne is churning out paletas, traditional Mexican ice-creams on a stick but with new-wave flavours. Dulce de Leche is all creamy, toasty caramel, while Salted Caramel and Popcorn is a take on one of the flavours of the century. Chia Lemonade is sweet and tangy at once, flecked with chia seeds, while Mandarin hits another summery note. Perhaps slightly less in the health-food corner is the Chocotella Paleta, taken up a notch with crushed peanuts and crushed Tim Tams. 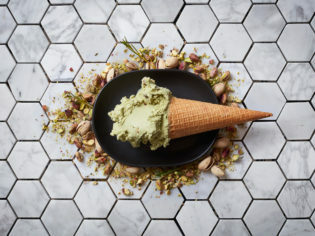 Do try: Pistachio, one of ChillBro’s best-sellers, with good reason. It’s yum.